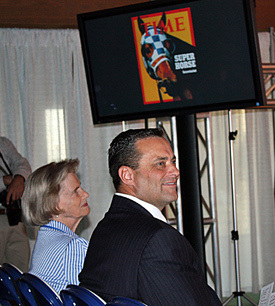 Upon hearing the powers that be at Nike and Kentucky left an eighth square blank in the waistband of their new uniform shorts, Penny Chenery leaned over a whispered in Billy Gillispie’s ear. All Gillispie could do was laugh. 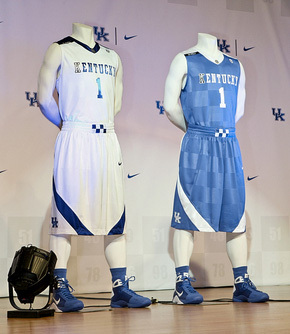 Kentucky unveiled its new uniform ensemble at a no-expense-spared VIP event on Friday and where it was revealed that the shorts included all seven of the Cats’ national championship years plus a box for the next one the message from Chenery was perfect. The owner of super horse Secretariat knows what it’s like to have a whole world watching. Drawing inspiration from Secretariat’s distinctive silks and the Commonwealth’s deep-rooted love affair with thoroughbred racing, college basketball’s winningest program set out to develop a uniform both unique and inspirational. The 18-month process culminated in a star-studded affair on Keeneland Race Track’s grounds that featured all seven of the Cats’ national title trophies and four lockers full of new UK gear. It was the perfect prelude to Big Blue Madness, set to take place just hours later at Rupp Arena. Nike’s creative team, led by a Corbin native, gave a 15-minute presentation on what went into the design of the new uniforms. The tighter fitting tops and longer shorts are 18 percent lighter than last year’s model, but the attention to detail was stunning. The uniforms have a muted checkerboard pattern designed to evoke images of Secretariat’s blue and white checkered silks storming down the lane in the 1973 Belmont Stakes. There are also two tributes to the late Bill Keightley – a black ‘K’ in the word ‘KENTUCKY’ and a small black vertical patch that reads ‘Mr. Wildcat’ in script. The entire team entered the event wearing the full ensemble, complete with royal blue shoes that they will wear this season. As for that empty box, well Gillispie had a message for Mrs. Chenery as well. “Our goal at Kentucky basketball is to fill in that last box,” Gillispie said.